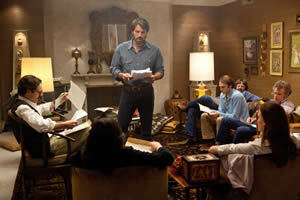 The new thriller Argo — impressively directed by Ben Affleck — brims with fakery, much of it deadly serious. Affleck perfectly blends a near-satirical take on Hollywood hucksterism with a pulse-pounding thriller about the rescue of six Americans who were hiding in the Canadian ambassador’s home in Tehran after the 1979 start of the Iran hostage crisis. Argo revolves around a plan so bizarre, it almost requires extra suspension of disbelief. But wait. That’s not entirely true. Though enhanced for entertainment purposes, Argo tells a true story. In it, Tony Mendez (Affleck), a skilled CIA agent, poses as a Canadian money man to cook up a scheme in which he’ll fake the making of a major Hollywood movie. Mendez will then enter Iran, claiming that he’s on a location-scouting mission. The fake movie — called Argo — supposedly requires arid backdrops for its Star Wars-like story. It’s also supposed to serve as a cover for the escaping hostages, who’ll pretend they’re part of the movie’s crew. Lacking any other ideas for rescuing the six Americans, the CIA adopts what it considers “the best bad idea” available. Skillfully using real footage throughout, Affleck begins with a quick prologue tracing the rise and fall of the Shah and his replacement by Ayatollah Khomeini. This refresher course sets the table for a movie that spans improbable psychic distances: from Washington to Hollywood to Istanbul to Tehran. Affleck brings frightening power to the moment when Iranian throngs overrun the U.S. embassy, allowing us to experience what it might be like to find ourselves in the midst of a hostile crowd fueled by its idea of righteous anger. The storming of the embassy is as harrowing as some of the Hollywood scenes are amusing. For the record, the mob held 52 Americans hostage in the trampled U.S. embassy while the six Americans on which the movie focuses made their way to the Canadian ambassador’s home. Affleck receives whip=smart support from John Goodman, as savvy Hollywood make-up artist John Chambers, a specialist in prosthetics, and from Alan Arkin, as the cynical producer of the fake film. If there’s any justice, Arkin’s performance as Lester Siegel will earn him an Oscar nomination in the supporting actor category. Is there anyone better at making a wisecrack sound like the unassailable voice of experience? The movie’s other stand-out performance belongs to Bryan Cranston, Mendez’s boss at the CIA, a Washington-based agent who must fight his way through various obstacles to provide Mendez with the back-up he needs to make his crazy plan work. Chris Terrio’s screenplay recognizes that people under extreme duress often try to cover their stress with humor. When Siegel says he wants a credible script, he reinforces the point by insisting that if he’s going to make a fake movie, it damn well better be a fake hit. The Hollywood scenes are entirely justified because the success of Mendez’s scheme depends on establishing the aura of a credible production. The assumption is that the Iranians will check to see whether Argo qualifies as the real deal. It costs the CIA $15,000 to option the Argo script, which has been languishing in turn-around. I don’t know how much liberty the screenplay takes with real events, but Affleck wisely engineers the movie for maximum suspense, tightening the screws of tension as he goes. The only performance that gave me any pause was Affleck’s. Bearded and sporting 70s length hair, Affleck tends toward unmodulated seriousness. Maybe it makes sense: As the movie’s director, he probably didn’t want to dominate a story that has lots of moving parts. I don’t think there’s false note in Argo until an ending that has Mendez reuniting with his estranged wife. Perhaps Affleck felt the movie needed an epilogue to balance with the prologue that began it. But considering how much has been accomplished prior to that, why quibble? Argo reminds us of what we should expect from a lot more mainstream movies: terrific stories told with insight and style.